Since service workers form the basic layer upon which these features can be built, it is important to take technical dive into what constitutes them and also how to implement them. Here are some points that are noteworthy with respect to service workers. 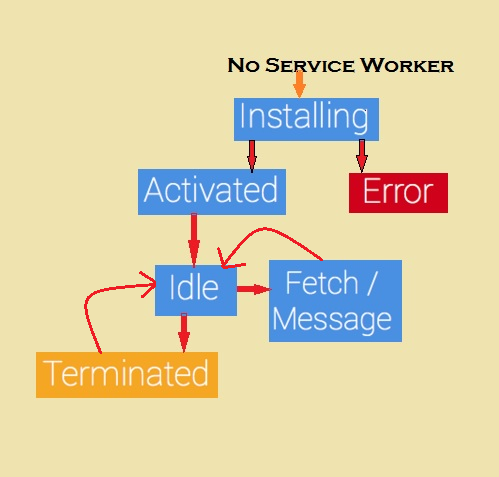 Service worker is mainly a network proxy that is programmable. Therefore, it allows you to control the manner in which network requests from your page are handled. They are terminated when their use ceases and also restarted when they come of use. Thus, one cannot rely on the global state of any of service workers onmessage and onstate handlers. If, in case, you have information that might be needed across the various restarts, service workers can access the IndexedDB API. One can obtain the caches polyfill from the given repository in GitHub, https://github.com/coonsta/cache-polyfill. You can use this on your site and use a service worker with the importScripts method in it. Any script that is imported is cached automatically by the service worker. The polyfill adds support for Cache.andAll, which is presently not supported in Chrome M43’s CacheAPI implementation. When it comes to service workers, they are very powerful means that can hijack connections, even fabricate and filter responses. Now, while this might be put to good use by a developer, a hacker certainly won’t. During development, a localhost may be enough for the use of service workers, but HTTPS is necessary for their deployment in a site. Thus, one can only register for service workers on pages that are served over HTTPS connections. This assures users that they haven’t been tampered with enroute to their browser. GitHub, being setup over HTTPS means that you can use for hosting your demos. If you wish to obtain HTTPS for your site, you will need to get a TLS certificate that needs to be setup on your server. The process can vary and be sure to check your server’s documentation. Now that we have taken care of HTTPS and polyfill, we shall go ahead into the main course of action with the registration and installation of a service worker. // Registration was successfully done. // registration for service worker has failed! The given code it meant to check if the API for a service worker is available and if so, the worker at /sw.js is registered. For checking, you can see if a service worker is enabled by going to chrome://inspect/#service-workers and then looking for your website. After the controlled page that takes care of the registration process, we come to the service worker script that handles the installation part. Seek confirmation for the required caches and whether they have been successful. The caches.open, along with the cache names can be used for calling and we can also call cache.addAll to pass all the files. This is also basically a chain of promises. On the successful caching of all the files, the service worker is installed. If not, this particular step fails. Caching and returning requests – How to do them? After the installation of a service worker, you might want to return one of the responses. When a user moves away to a different page or even refreshes the page, the worker will receive fetch events like the one given below. Here the fetch event has been defined and in the event .respondWith, and from caches.match we pass in a promise. The latter looks for requests and finds cached results from the caches created by the service worker. If there is a response that matches, the cached value is returned or else the return of a call is made to fetch. // once by cache and another by the browser for fetch. Thus, it is necessary to clone the response. // IMPORTANT: Cloning the response here. Service workers have seen more implementation these days and have proven to be more than just useful. As more and more features are required without really affecting the actual web page, service workers help developers live up to these expectations. Some of the features that have been implemented are the likes of syncing in the background and push notifications without making use of native applications to solve the purpose. The above article is a very basic means to get started with service workers. It covers registration, installing and the returning of responses by using service workers.